Freedom FM – 106.5 | Maduro rejects call for elections amid mounting pressure. Home / Regional / Maduro rejects call for elections amid mounting pressure. Maduro rejects call for elections amid mounting pressure. 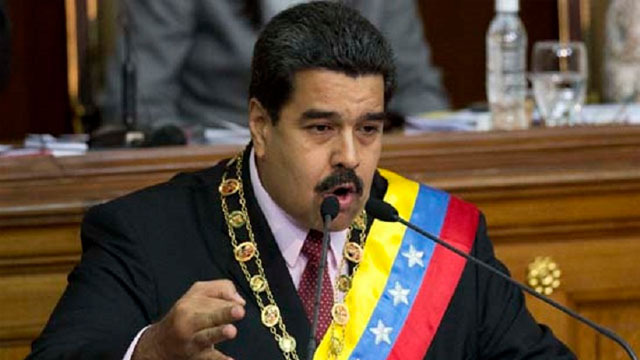 Venezuela’s President Nicolas Maduro on Sunday (Jan 27) rejected a European ultimatum that he call elections as opposition rival Juan Guaido stepped up appeals to the military to turn against the leftist government. The United States separately warned there would be a “significant response” if US diplomats, Guaido or the opposition-controlled National Assembly were targeted with violence and intimidation. Australia followed, saying it “recognises and supports” Guaido as interim president pending elections. “They should withdraw this ultimatum. No one can give us an ultimatum,” Maduro told CNN Turk in an interview dubbed into Turkish from Spanish. “Traitors never, loyal always,” he exhorted the military audience. Televised images showed tanks lined up in a row and soldiers firing their weapons. “Are you coupsters or are you constitutionalists? Are you pro-imperialist or anti-imperialists?” Maduro asked. Vecchio, who lives in Florida, met with Under Secretary of State for Political Affairs David Hale. The US official, in turn, “reaffirmed the United States’ strong support for interim President Guaido’s leadership of Venezuela,” the State Department said. Guaido, 35, heads the opposition-controlled National Assembly and declared himself acting president in Caracas on Wednesday during an anti-government rally by tens of thousands. He contends that Maduro’s re-election to a second six-year term was fraudulent. Guaido’s bid was swiftly endorsed by Canada, the United States and many Latin American countries. “Any violence and intimidation against US diplomatic personnel, Venezuela’s democratic leader, Juan Guaido, or the National Assembly itself would represent a grave assault on the rule of law and will be met with a significant response,” US National Security Advisor John Bolton tweeted, without specifying what kind of response he meant. The warning didn’t address specific groups or individuals, but Bolton noted in a linked tweet that Cuba’s “support and control over Maduro’s security and paramilitary forces” was well known. Although he professed himself “open to dialogue,” he acknowledged it was unlikely. “I sent many messages to Donald Trump,” he said in the CNN Turk interview. “I don’t know of anyone calling for military intervention,” Rubio said. Guaido has aimed his appeals at the Venezuelan military, with promises of amnesty, and mass protests to dramatize the depth of popular opposition to Maduro who has presided over a virtual collapse of the economy and a severe humanitarian crisis, with shortages of food and medicines. On Sunday, Guaido attended a mass in Caracas in honor of the political prisoners and opposition leaders in exile, as well as the almost 30 people killed and the more than 350 arrested in clashes with security forces in the past week. In line with a request from Guaido, his supporters on Sunday circulated copies of amnesty measures approved by the National Assembly to friends and relatives in the military. Venezuela’s military attache in Washington, Army Colonel Jose Luis Silva, switched his support to Guaido in a video that called on his brothers in arms to follow his lead. At a special UN Security Council session Saturday, US Secretary of State Mike Pompeo described Maduro as part of an “illegitimate mafia state” responsible for Venezuela’s economic collapse. Pompeo urged nations to end financial transactions with Maduro’s government, which has struggled to pay bills despite the country’s oil wealth. Russia has denounced the United States for attempting to “orchestrate a coup d’etat,” and denied reports that 400 members of a private Russian military group were in Venezuela to protect Maduro. The Venezuelan leader earlier gave US diplomats until late Saturday to leave the country.